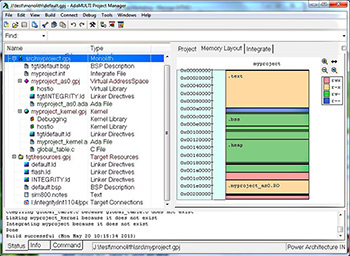 The AdaMULTI IDE brings the industry-leading debug and development tools of Green Hills MULTI IDE to Ada developers. For decades customers have used our tools and Optimizing Compilers to dramatically improve their debugging productivity. The result? A more reliable product, brought to market more quickly, with lower development costs. The AdaMULTI Project Manager simplifies how you build and update your application. Tabbed block diagram and memory layout views provide an at-a-glance understanding of application structure. Our revolutionary Debugger is designed to quickly solve problems that stump traditional tools. For those bugs that use to take weeks to track down, the TimeMachine tool suite helps you solve the same problems in hours or even minutes. DoubleCheck, our integrated static analyzer, saves time and money by identifying programming errors before running your program. Run-time error checking complements DoubleCheck by finding bugs that cannot be identified by static analysis alone. Clean coding conventions prevent you from introducting new bugs with overly compex code. Tools suchs as the OSA Explorer, EventAnalyzer, and Target List provide a scalable view of an entire system, from an all-inclusive, holistic level down to each register bit or machine instructions. A simble build configuration and seamlessly integrated tools free you to spend more time developing. The Builder significantly reduces project development overhead by seamlessly integrating project manager, editor, flash programmer, and instruction set simulator functions. The entire family of Green Hills Software's safety critical run-time products are supported by the AdaMULTI software development environment. Tightly integrated with INTEGRITY-178B and the bare target Ada run-times, AdaMULTI automates all aspects of embedded, safety-critical software development. AdaMULTI features Ada and C/C++ compilers, a source-level symbolic debugger, and an automated program Builder. 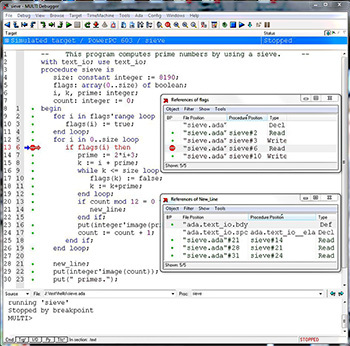 AdaMULTI also provides a version control system, the EventAnalyzer, a code performance and coverage profiler, a source code navigation and cross reference browser, a language sensitive editor, dependency and call graph displays, a processor-specific/INTEGRITY-178B simulator, and unit test tools. AdaMULTI also provides the embedded industry's most robust and comprehensive set of debugger-to-processor connectivity options including: serial, ethernet, In-Circuit-Emulators, processor probes, and JTAG/BDM interfaces. Casts and coercions are performed implicitly and ambiguities regarding overloaded operators and functions are automatically resolved. AdaMULTI is fully aware of the complex features of both Ada and C++ languages. This makes is unnecessary to mentally translate Ada and C++ constructs into the mechanisms used by the compiler. AdaMULTI can also call C++ member functions from the command pane.